I’ve been making ice cream for some time. Quite a few years ago, I bought a fancy Italian gelato maker from (the now-defunct) Sharper Image. Considering the cost of that machine and how little it was used, quart for quart, that was some of the priciest ice cream … er … gelato that I’ve ever eaten. I never did get the chance to make enough to bring the costs down because the machine was a casualty of the move to my current home. Undeterred, I dove back into the pool and purchased a model from Cuisinart, as well as an extra freezer canister. I love this machine and it’s definitely paid for itself. Not only have I made ice cream for my friends and neighbors but I’ve brought it with me to Michigan and made ice cream for Zia and her friends. As for the many recipes I’ve tried, we are all in agreement that today’s recipe makes the best ice cream. It was almost 2 years ago, during another long and sleepless night, that I came across a recipe for cheesecake ice cream. It called for cream cheese and, although tasty, it was, as a friend (the Entertainer) said, “… more like a frozen piece of cheesecake.” I kept searching until I found today’s recipe, which was posted by Melissa Symington on AllRecipes.com. Far and away, it is the best ice cream recipe I’ve come across in quite some time. Granted, by using a pudding mix, it is not a true ice cream and some ice cream purists may find that objectionable. Luckily, I’m not a purist nor are any of my friends and family. This is one ice cream recipe that I’ll make again and again. The recipe presented below is pretty much the same one I found that night. The only changes I’ve made are to add a pinch of salt to each of the 3 preparations and to replace the milk with half-and-half. The yield is about 2 3/4 quarts of ice cream, although I’ve seen versions of this recipe where the ingredient amounts are all halved. Of course, the results are every bit as good as the original but then you’ve little to give to your friends. Trust me. Once they taste this ice cream, they’ll be asking for more. Make a full-batch and you can make everyone happy — well, maybe not your cardiologist. In a small saucepan, combine sugar, salt, and cornstarch. Gradually stir in water until smooth. Stir in blueberries and lemon juice. Bring to a boil. Reduce heat; simmer, uncovered, for 5 minutes or until slightly thickened, stirring occasionally. Cover and refrigerate until chilled. In a large bowl, combine the cracker crumbs, sugar, salt, and cinnamon. Stir in butter. Pat into an ungreased 15-in. x 10-in.x 1-in. baking pan. Bake at 350 degrees F for 10-15 minutes or until lightly browned. Cool completely on a wire rack. In a large bowl, whisk the ice cream ingredients. Fill ice cream freezer cylinder two-thirds full; freeze according to manufacturer’s directions. Refrigerate remaining mixture until ready to freeze. Whisk before adding to ice cream freezer (mixture will have some lumps). Crumble the graham cracker mixture. 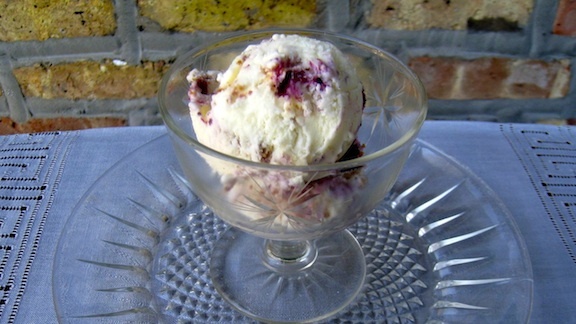 In a large container, layer the ice cream, graham cracker mixture, and blueberry sauce three times. Use a spoon handle, chop stick, or similar object to swirl the now-full container’s contents. Freeze. 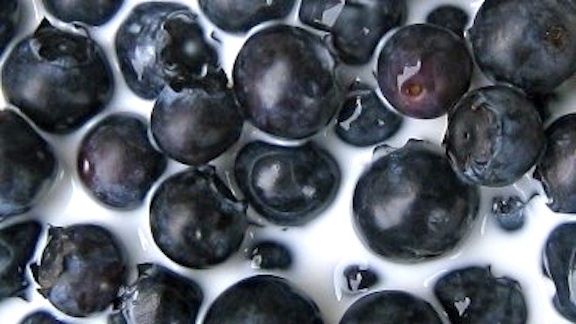 Although not a problem with the blueberries in this recipe, I find that large pieces of fruit or berry usually do not freeze well in home-made ice cream. The water content of the fruit turns to ice and the resultant shard-like texture interferes with my enjoyment of the luscious cream across my palate. (Yes, I’m fussy about my ice cream.) So, to avoid this, if I’m going to use another fruit or berry in this recipe, I’ll pass them through my Roma strainer or, at least, purée them before preparing them for addition to the frozen cream mixture. This way I get all the flavor but none of the ice shards. 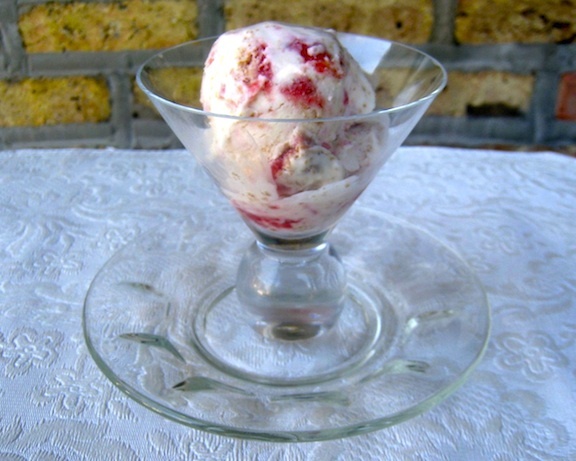 That is how I prepared the strawberry ice cream pictured above, as well as a black cherry version of this same recipe. One of the things that sets this ice cream apart is the graham cracker crumble. Reminiscent of a cheesecake’s crust, you do not want to skimp or skip this ingredient. Still, the recipe makes a great deal of the crumble and, like me, you may find there’s too much. Use as much of the crumble as you like and store the rest in your freezer for next time. I’ve no idea how long is should be frozen because mine has never been in the freezer for more than a couple weeks. This is one very popular ice cream. It is possible to make ice cream at home without an ice cream maker. (I know because I forgot part of my machine during a recent trip to Michigan.) Granted, it may not be as easy as pouring ingredients into a frozen canister and pushing the “on” button but you can still make ice cream. First off, combine the ingredients listed above in a sturdy glass or stainless mixing bowl. Mix well and place the bowl and its contents into the freezer. Remove the bowl after 45 minutes and give its contents a good stir. Work fast. You can use a hand mixer, stand mixer, immersion blender, whisk, or spatula. Place the bowl back into the freezer. After 30 – 45 more minutes, remove the bowl and give it another good stir. Repeat the process again and again and again. It will take a few hours but you will eventually have a mixing bowl filled with ice cream that is as “solid” as you would get from a machine. Not only that but, believe me, you’ll never forget part of your machine again. This entry was posted in Sweets (Dolci), Vegetarian and tagged Dolci, Food, Fruit, Ice Cream, Recipes by ChgoJohn. Bookmark the permalink. Blueberry, Cheesecake and Ice Cream can’t go wrong with that! Looks great. It really is a good recipe. My friends are all hooked on it. Thanks for stopping by. Alright already I’m going to buy an ice cream maker. Hmm, wonder if Katherine would go for buying one of those gelato makers. I like your description of frozen cheesecake and the mix seems like a good way to solve that. When shopping, check to see if you can get a 2nd freezer canister. It really will come in handy and I’d be lost without mine. And if you do get one, this recipe is a good one to christen it. It’s 95F in Chicago and you’re posting ice cream recipes! Evil genius! Now I need to break out my ICM from storage. Thanks for the inspiration! Let loose the ICM! If ever there was a time to use it, this be it. My ince cream maker gets a lot of use during warmer months. This recipe sounds and looks delicious! Your ice cream maker sounds about as over-worked as mine is. This recipe is, hands-down, the favorite ice cream of my friends and family. Try it and if you feel you have a better one, please share the recipe. This is one contest I don’t mind losing one bit. Thanks for stopping by. Wow, I really need to open up my new ice cream maker. I bought it in January! I love cheesecake so this is a wonderful idea for ice cream! To own an ice cream maker and resist using it for months? You are made of stronger stuff than I and I tip my hat to you. Thanks for stopping by. Cannot stop eating this ice cream. Thank God the cheese, bread and stuffed shell season is on hiatus! Ah, Jake. Glad you’ve enjoyed the ice cream and I hate to break it to ya but I’ve revived the sourdough starters and will soon be putting them to work. Those aren’t clouds but loaves of bread on your horizon. With your love of blueberries, Christina, I’d suggest buying a couple boxes of the pudding mix because you are going to really love this ice cream. It is, by far, everyone’s favorite. When it comes to flavor, I’m not a purist either. If something works, it works. Besides, take a gander at what the commercial ice cream boys sometimes use – in comparison, pudding mix looks like a homegrown organic ingredient! We have that Cuisinart ice cream maker, too, and it works great. Haven’t made ice cream yet this year, and the weather has just turned hot, HOT, H O T! Maybe this is in our future. 😉 Good stuff – thanks.